Regardless of all the noise on Twitter and Reddit and Discords/Telegram/Slacks the last few days about "BCash" this, and Roger Ver that, don't lose sight of what Bitcoin Cash is: a community-activated hard fork of Bitcoin to solve both the high transaction fees and slow confirmation times caused by the 1MB block cap and the infiltration and subversion of Bitcoin Legacy by Blockstream, who is entirely backed by a group of really nice guys like Axa and Mastercard et al. You know, a really similar group to the "big money" that's coming to Bitcoin Legacy that you're somehow supposed to benefit from, even though you're the source of profit on their winning trades. It'll take you about an hour to read through the entire post and all its links, but since you're dealing with an investment in the future of the world's money, this is not much of a sacrifice to make, in my opinion. Right now, as far as BCH price action goes, there is nothing bullish to discuss. We trade at the support line of the Kumo on the 1H chart. Tenkan-Sen has crossed well under Kijun-Sen, and all oscillators are showing no signs of reversal. 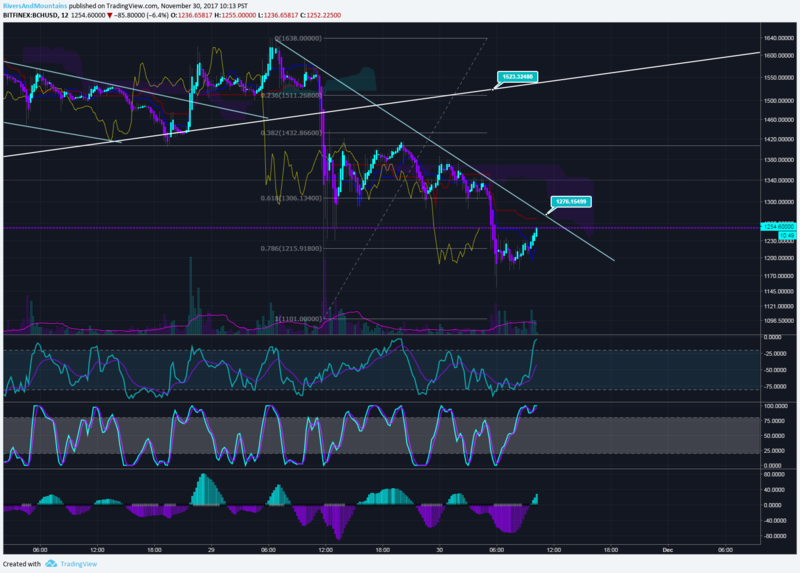 What does have some signs of good news is that we are in an immediate falling wedge pattern, which does often reverse at the bottom, break out, and lead to a new run. We are also inside of a larger ascending triangle, where upwards breakouts often happen, and towards big gains. That being said, we have no bullish indicators that this is going to happen, so we look for bounces and reversal patterns in the key $1400-$1420 zone. If we do not receive a bounce at this area, the next chance is $1320. Anything further than that on any sustained time scale will confirm a very bearish trend reversal. During the "Tether FUD Night", as I affectionately refer to it, I wrote an article illustrating the issues with much of the arguments opposing Tether. To clarify, that was not because I believe Tether is okay or good, but because I saw that it was being used to manipulate people amidst a setup. As we stand now, 95 million Tether has been issued in the last 48 hours. 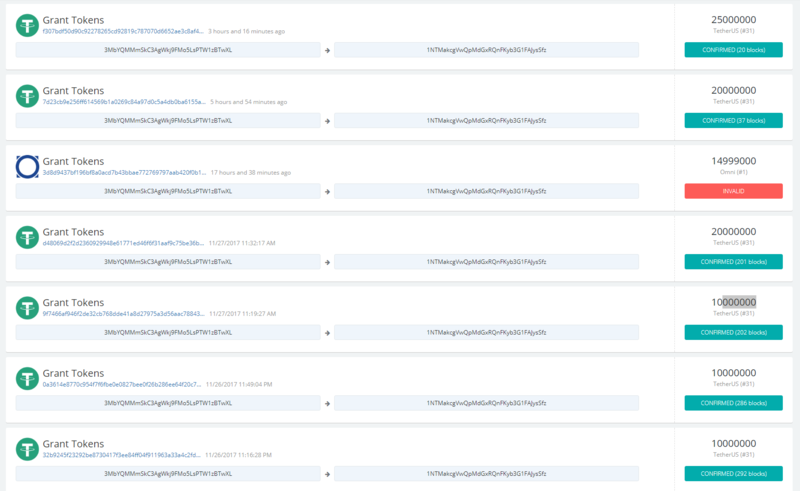 That one transaction for 15 million Tether's that's invalid appears that it may be a security vulnerability in Tether/Omni related to the previous "Tether Hack" on "Tether FUD Night". 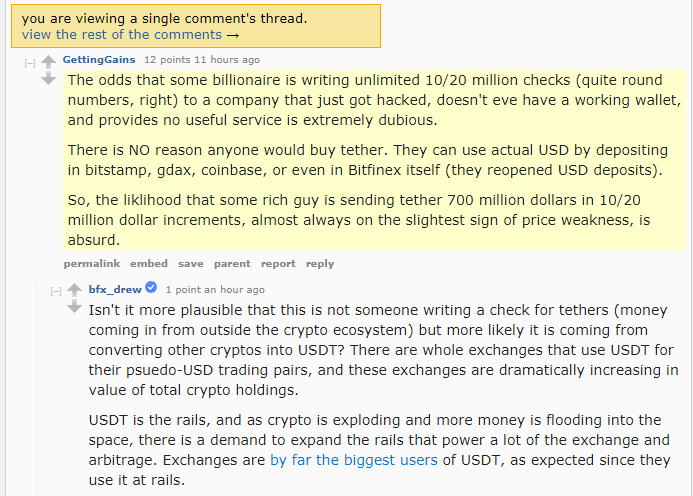 Although I can't find much besides speculation on it, on Tether FUD Night I had concluded that if the Tether hack was actually legit, then it would indicate there's a major exploit available in either Tether or Omni. This would seem to explain another problem in the market at the moment: the "bull market" alts are in. 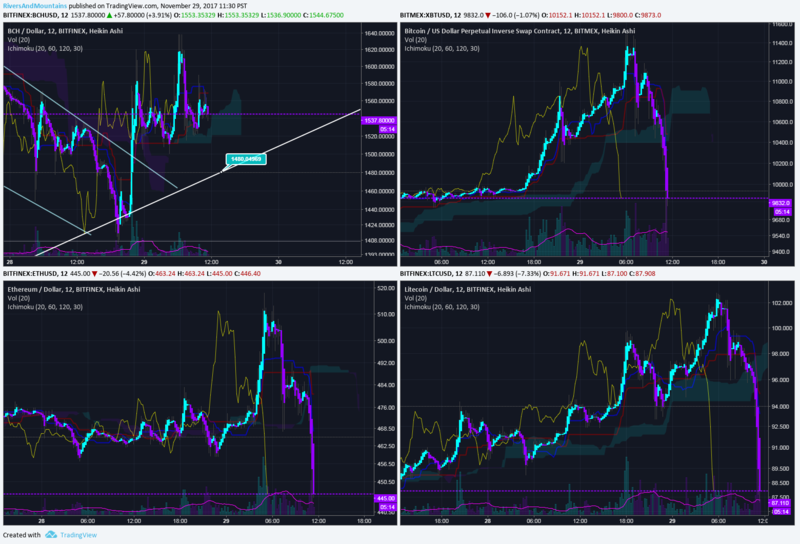 It would also confirm a pattern recently that's shown both Bitcoin Legacy and Bitcoin Cash dumping at relatively similar times while other alts pump. 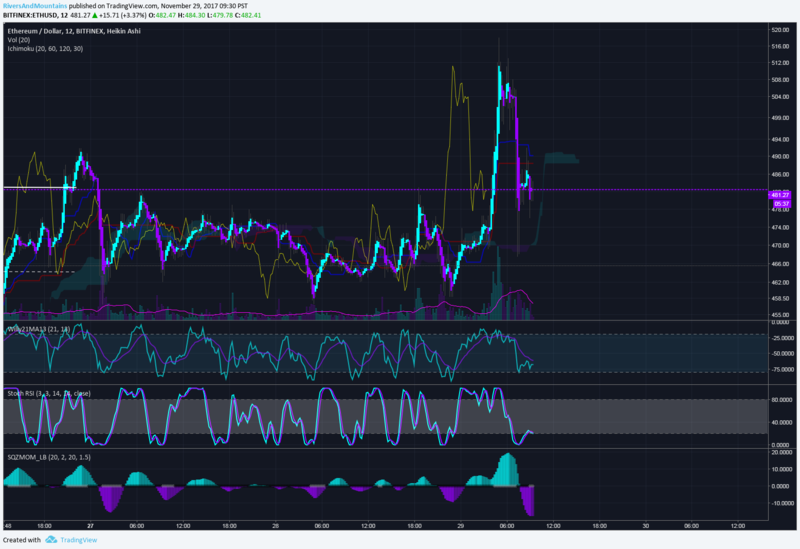 It seems that perhaps rather than exiting into USDT on many exchanges, people are converting to alts, and inevitably buying the tops. If this situation turns out to be true, I can assure you that it was intended that way for the purposes of leaving you holding bags. There is much, much danger in this situation. Right now, to me, everything feels like it did in September before massive market corrections ensued. The market right now is like a dry forest in the peak of summer. One spark, and it's a raging inferno. For this reason, I've taken a small portion of position as profits and withdrew to fiat, and have withdrawn all coins from exchanges to cold storage. The reality is that day trading is the nearly exclusive source of the adage: "90% of traders lose 90% of their account within 90 days". The reason for that is, you can neither intellectually nor emotionally endure the short-term noise and swings. Nor should you be able to. It is hard by design, and the methods have decades of research, development, and fine-tuning that have gone into them to get you to part with your money. A friend of mine even told me today that because of that Roger Ver interview, a friend of his who's a Doctor decided it was time to trade his BCH for BTC. Well, he literally just sold the bottom of BCH and longed the top of BTC when it comes to the ratio pair. And why? Because the echo chamber worked its magic, again. In fact, the echo chamber is why BTC is pumping and BCH is falling. The way they manipulate your emotions and your doubt as you endure the pain of watching your market not gain, but lose, while the competitor can't lose, and only gains, twists all the right screws with all the right screwdrivers. And they shake your money out of you upside down, just like a bully on the Grade 6 playground. The solution? Buy BCH during consolidation periods and pullbacks, withdraw it from exchanges, put it into a hardware wallet, and just be patient. Perhaps on one short-term trade you might pick up $70 or $200 worth of points. Yet, on a longer-term trade you will pick up $700 or $2000 worth of points. Which is more profitable? Which is easier? Which is easier and more profitable? Trade carefully friends. Something stinks like a dead body, and it's all across crypto. If Bitcoin Cash does not serve as a safe haven during a market correction like it has the last two times, it will also dump along with everything else. 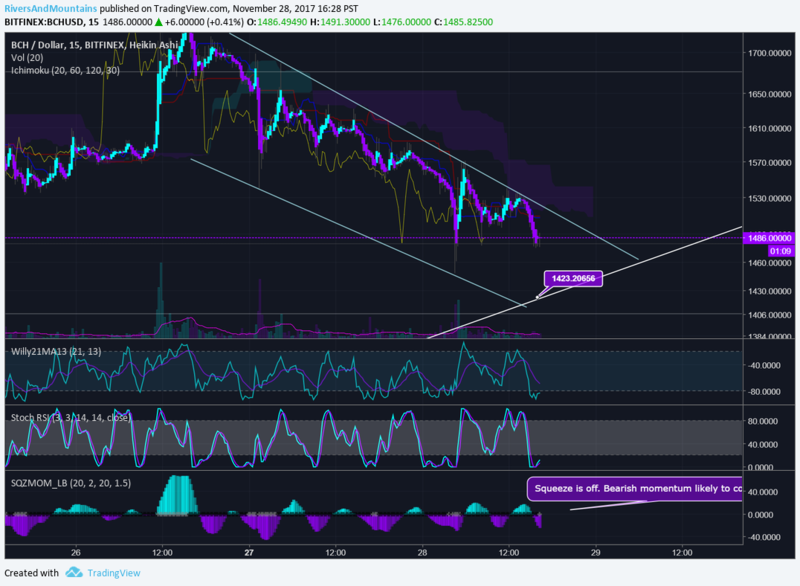 Bitcoin Cash price continues bearish momentum, bouncing off the top of the falling wedge. Still under the red Kumo. Squeeze is now off on momentum oscillator and I expect the dumps to continue. If you're looking for opportunities to add to long-term holdings, $1400 and $1300 are excellent spots in my opinion. For short term/day trading/margin trading, long positions should still be deferred until reversal patterns are seen at major support levels. Bitcoin Legacy continues towards $10,000 all the same. Please bear in mind the market is vulnerable right now to "news" and many, many coins are very extended in their pricing. Trade carefully, and don't panic. I believe core holdings should still be left for the long and medium term targets of $3500 and $5500. Bitcoin Cash price action respected the major trend line, with a major bounce. Meanwhile, Bitcoin Legacy raced to nearly $12,000. Coins like Ethereum had a big run to $520 annihilated amidst the $1,000 Bitcoin Legacy drop. The entire market is showing its fragility at the moment, and one should be careful. Right now our price action is a reversal pattern from the falling wedge, but it's not showing bullish momentum. 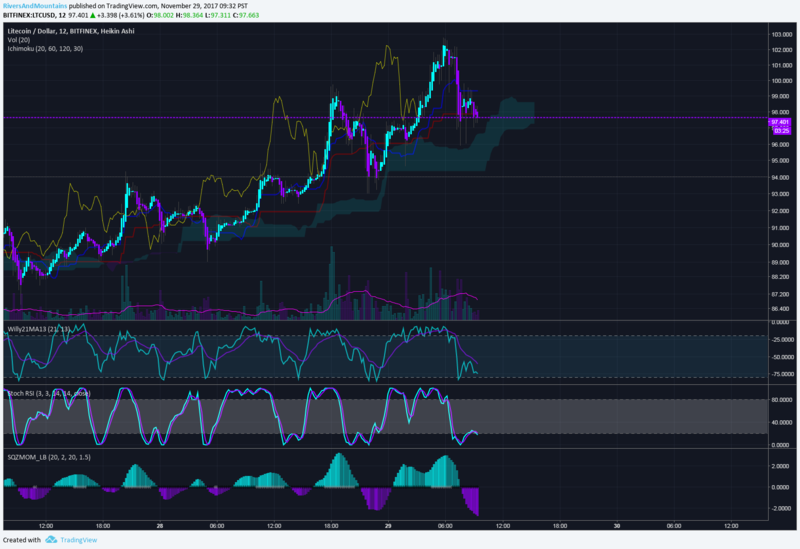 It could fall further, through the cloud, and towards the trendline. It could fall through the trendline to the $1320 support area we discussed earlier. 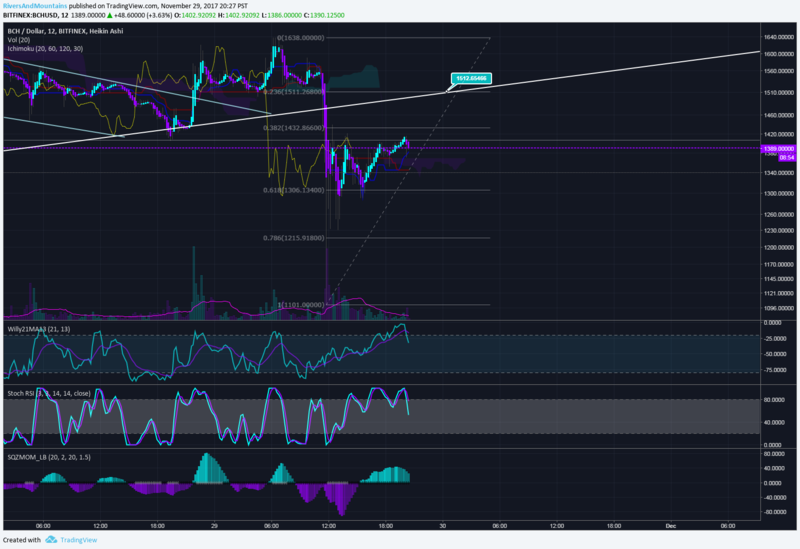 I have reservations this is a risk, because it seems buyers are content to let weak hands and short sellers sell to them, but in any event, this market is quickly approaching a very chaotic situation, so please exercise caution. 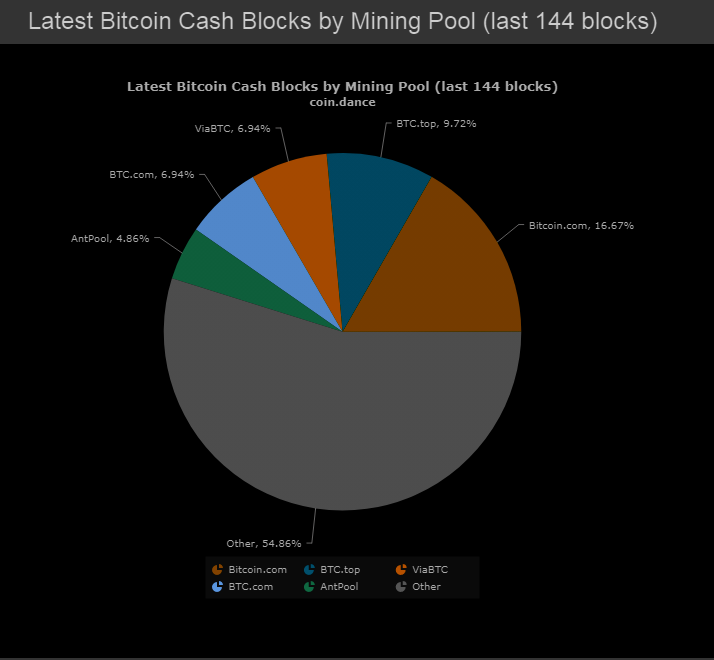 The Unkown pool has been doing most of the lifting, while ViaBTC, BTCTop, Antpool, and BTC.com have had extended block discovery on Core. This is under the circumstance wherein Bitcoin Cash has still been within 1-2% as profitable to mine as Bitcoin Legacy. Currently projected to be a nearly 20% increase. Strong hands and long-term focus advised, friends. The situation, in one picture. You tell me. How smart was panic selling your Bitcoin Cash the last 48 hours? Virtually every market looks the same right now. This pattern that you see is generally referred to as a bear flag. We now trade under the main trendline. Fortunately TradingView has updated properly the data from the Finex feed and we can see the price dropped to exactly $1100.00. This universe is so crazy with its coincidences. The reality is that these patterns are not bullish. If you look at only the price you see it keeps crawling up and crawling upwards. That is actually, ironically, not an indicator of strength. What we need to see to count as strength is some kind of sustained bounce over the 0.382 and more importantly the 0.236 fibs. Conveniently, the 0.236 fib also brings us back within the main trendline. What I expect to see is price action to snake/crawl and slowly, after much choppiness, return towards that $1500 mark and eventually break upwards and out of it. But, if this pattern breaks down, next support below the drawn fib line is in the ~$950-$980 area. It's a great opportunity to buy dips for spot and long term holdings. $1500 Bitcoin Cash is going to become a thing of the past an awful lot sooner than everyone thinks. Again, every market looks about the same right now. Dash is a bit of an outlier, but I wouldn't read much into that. When the whales are done, that centralized mess will come down hard. 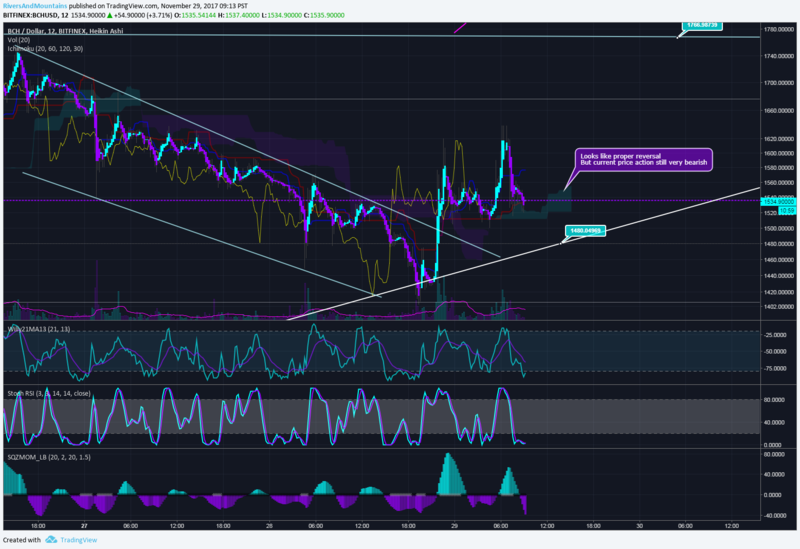 Right now we're at key action to see if Bitcoin Cash can break the downtrend line and start a reversal. Generally speaking, breaking these key trendlines is a major thing. That being said, this market is still not bullish. No market is. 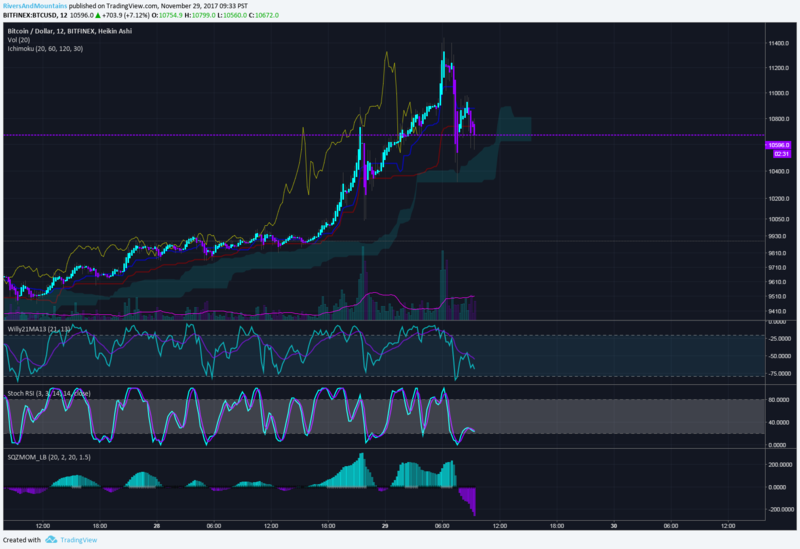 You have to bear in mind that after Bitcoin Legacy eats a $3000 drop and every single market follows it, the upwards momentum is halted. We are now in a strong downtrend and looking for reversal patterns. If this downtrend line is broken, Bitcoin Cash still needs to regain the main trendline at around $1600 for bullish momentum to continue. I would not advise selling any of your core position during this turbulence. However, if you've yet to take profits and want to, wait until price is in the $1400-1500 region agan and sell 25% of your portion. And please for the love of God don't sell into USDT. Bitfinex just scammed retail traders for millions and millions of dollars in margin trading scam. The house of cards will soon come down. Bitcoin Legacy on the top, Bitcoin Cash on the bottom. 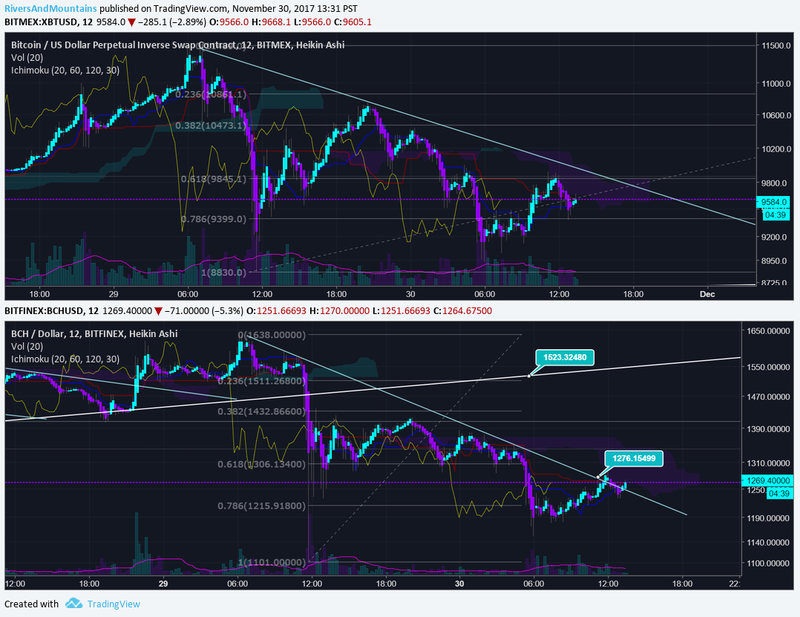 Both relatively equal situations in terms of how the charts look, yet, Bitcoin Cash is now the coin breaking out of its downtrend line while Legacy lingers. Perhaps it is a fortuitous omen. 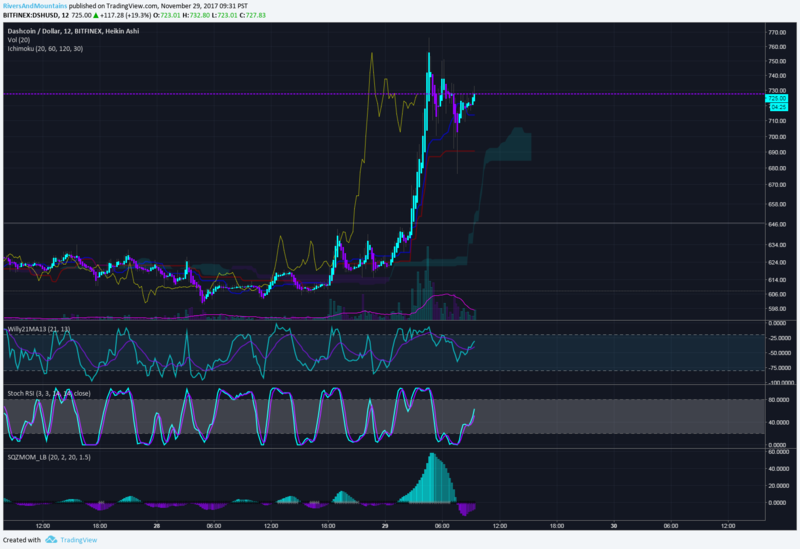 It's already a TA signal. Scamcoin blah blah but what if it's the plan?! ?